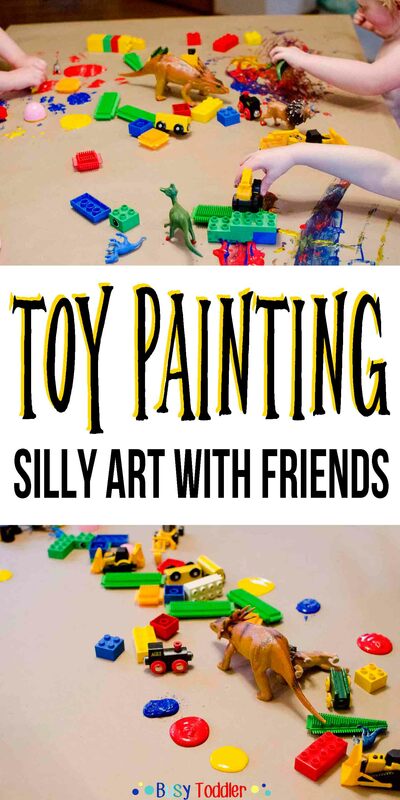 Toy paint is messy art fun for toddlers. Toddler painting parties are some of my favorite parties. Have you ever had a painting party? You gotta try this. It’s such a hit with the toddler crowd. 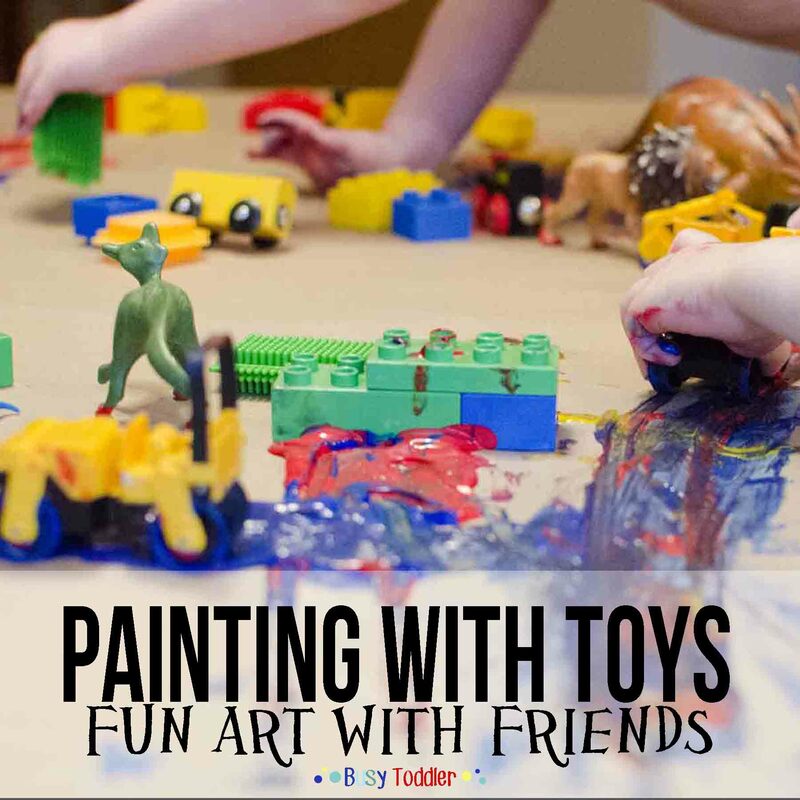 We recently had some toddler friends over for Toy Paint. 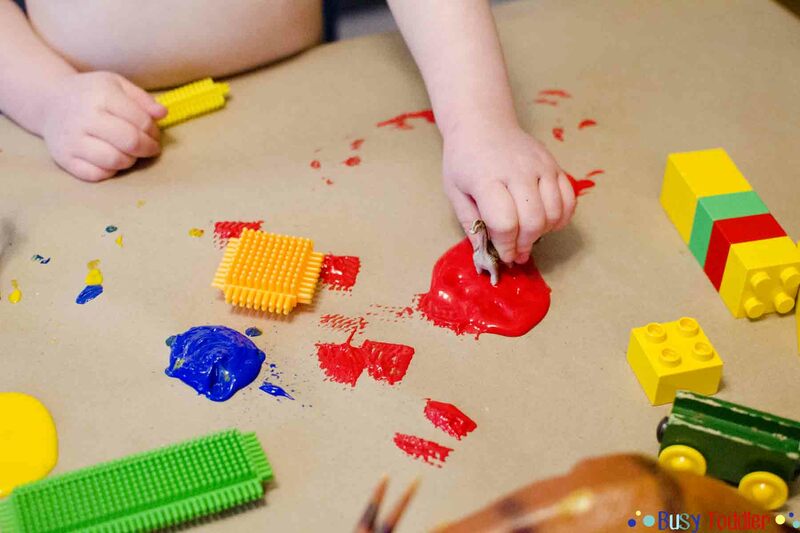 Oh my stars, did we land on a winning painting project with this toddler activity. Six thumbs up from three very happy, very messy toddlers. I’m a big believer in messy projects and activities. To me, it’s a part of childhood, part of the fun, and a way of life. Mastering how to handle these kinds of activities is how to make them a success (and keep your carpets clean). It’s all about planning and having an exit plan. I’ll walk you through my process in setting up and managing this toddler mess fest that happened just 8 feet away from my white couch. I started by covering our kitchen table with Kraft paper. I love Kraft paper. Bury me in Kraft paper. I would be utterly lost without it. Need to wrap a present? Kraft paper. Need a make shift table cloth? Kraft paper. 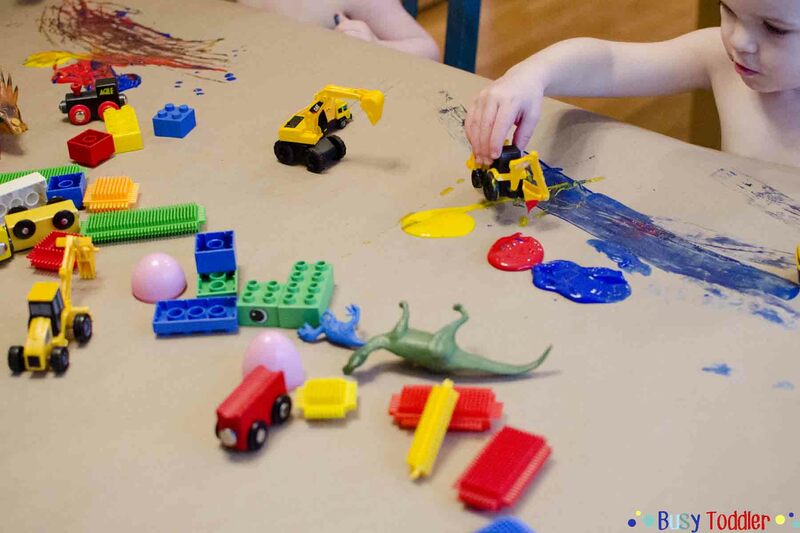 Having messy painting fun in a toddler activity? Kraft paper. It’s always the answer. I took a basket and walked around the house collecting toys that I thought would be fun to paint with, make cool prints, and be easy to clean at the end. 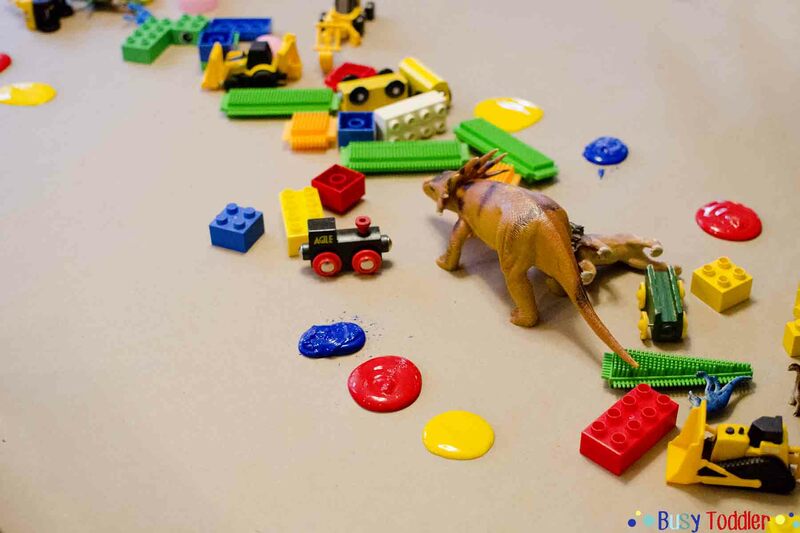 I came up with plastic animals, Lego Duplos, Bristle Blocks, small construction vehicles and a few other odds and ends (affiliate links). I squirted primary color paint in front of the stripped down toddlers and let them go to work. 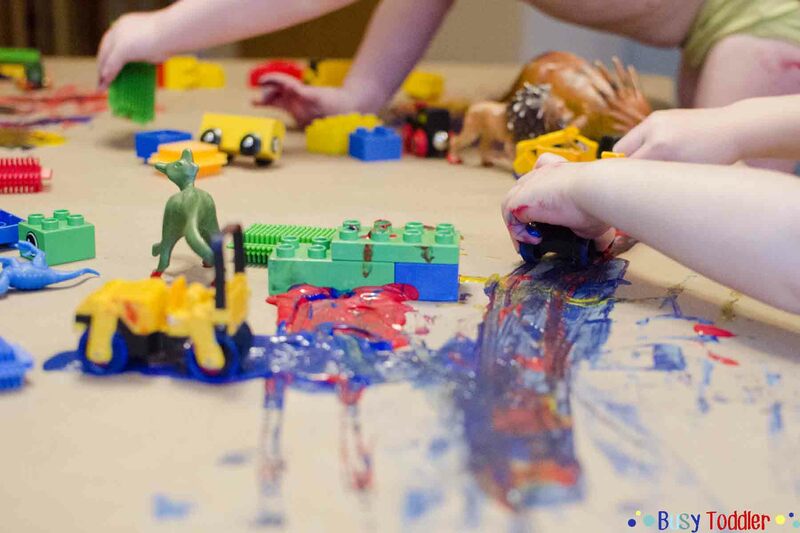 Part of my game plan during Toy Paint and other messy activities like this is to always have a wet washcloth in hand. This lets me wipe off spills that are too big or splats of paint that get on chairs or floors. Keeps the clean up to a minimum at the end by staying on top of it. The kids went crazy happy excited for this and loved every bit of it. They loved getting the paint everywhere and getting their little bodies covered in it. It was a Gwen Stefani amount of fun – you know, BANANAS. With my wet cloth, we (the other Moms and me) got each toddler clean enough to carry to the tub. We dumped all the paint covered toys in the tub with them, added a Popsicle for each kiddo and suddenly it was toddler activity 2.0. It was now a Popsicle-toy bath and we looked like Wonder Moms. The toddler and the toys got clean in the tub and the Kraft paper went right into the trash. Done and done. All was cleaned up and like it had never happened in under 3 minutes. 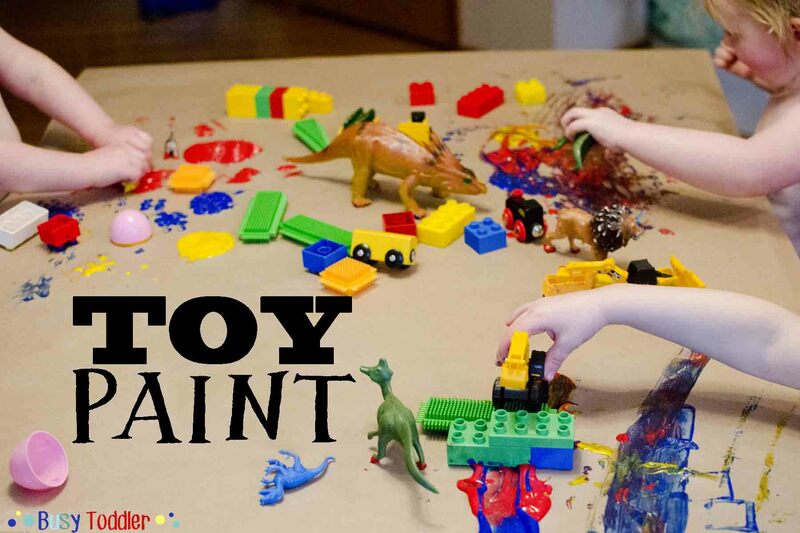 I love a good messy activity like Toy Paint. They may seem daunting and crazy and ambitious, but they don’t have to be. Stand back and take in the activity. How will you keep it under control during the fun? How will you set yourself up for an easy clean up? How will you get the toddlers clean? Do you like messy activities? 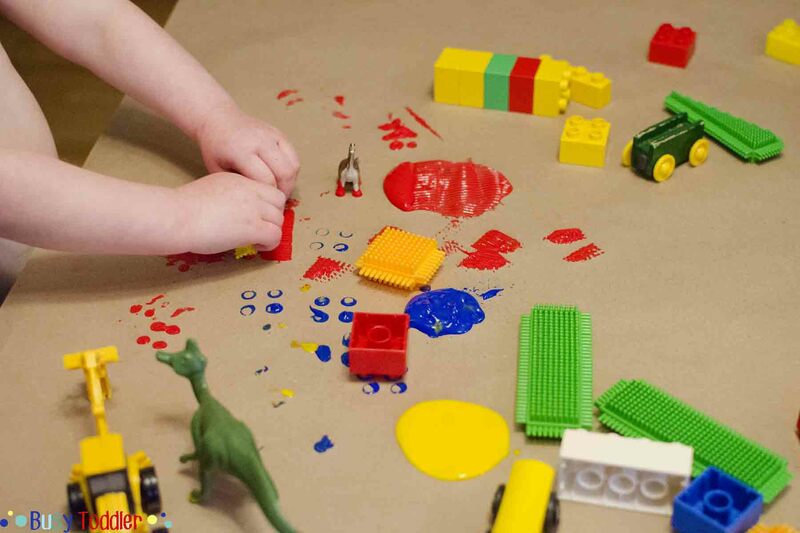 Would your toddler like toy paint?